It’s the first day of Lent. Some of you may have that Fat Tuesday hangover – sticky from King cakes and breath smelling of beer or vodka or wine or bourbon or whatever your D.O.C. (drink of choice) may be. I, for one, am not looking forward to the next 46 days without bacon. Then it hits me – today is a day of abstinence… no meat! So what’s a carnivore to do? Well, all good Catholics know the quick and (mostly) cheap way to adhere to their Lenten obligations – the good ol’ Filet-O-Fish. Back in 1962, a McDonald’s franchise owner in Cincinnati noticed his sales go down on Fridays during Lent in his predominately Catholic neighborhood. So he came up with the Filet-O-Fish, which was the first non-hamburger sandwich on the McDonald’s menu. It spread across many McDonald’s restaurants in 1963, and went nationwide in 1965. Since then it’s been a mainstay for Lent observers around the world. Continuing my “Fish Sandwich Fridays” kick, I decided to go back to the old standard – the one that started it all. 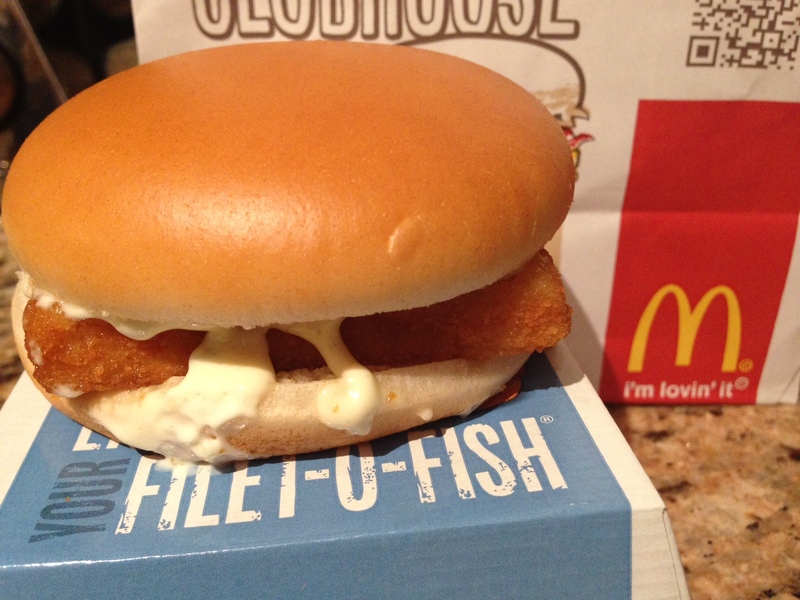 Before the Big Fish and the Premium Cod Fillet, McDonald’s Filet-O-Fish ruled the Lenten Friday fast food world. The Filet-O-Fish reminds me of childhood, cheesy commercials, and overall, a happier, simpler time. But some of our fondest childhood memories are not as good, or even outright disgusting when eaten in our adult lives. For example, what kid doesn’t consider Chef Boyardee some of the best Italian food out there? But now you’re an adult – if you think that bottle of Chianti is going to spruce up that Beefaroni enough to impress your date, you’re sadly mistaken my friend. As I bit into the first sandwich, memories of childhood flooded my brain’s synapses. The bun is warm impossibly soft as a pillow, the sauce is tangy and delightful, and the fish is light and fluffy. Great stuff – I could eat two of this sandwiches without blinking an eye. Oh – that’s why they probably have the “2 for $4” special!